Most of my heroes are dead. I have been ice climbing for over twenty-five years. 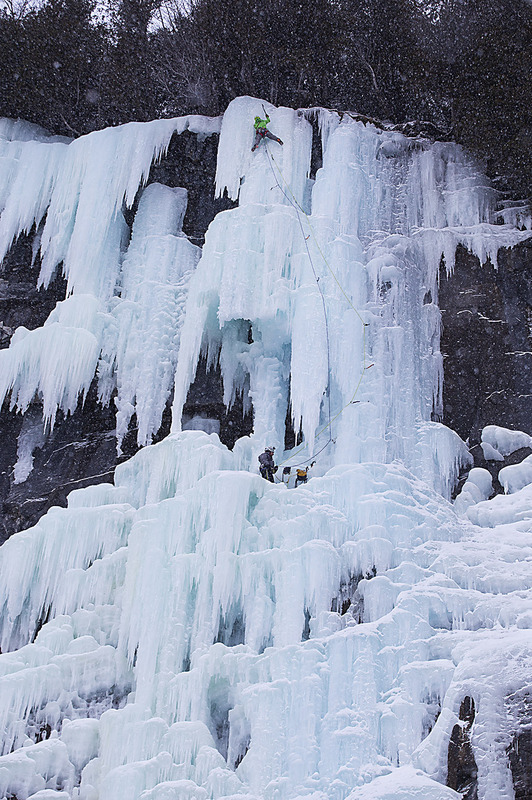 Climbing is a dangerous game but ice climbing and alpinism are even more so. Well-known climbers like Guy Lacelle, Ueli Steck, Craig Luebben, Alex Lowe, Sue Nott, and Karen McNeill had a big impact on me. I still hold them all on a high pedestal, but they are gone. A very good friend lies in the hospital right now fighting for his life. I shed tears thinking about it. Yet despite all this, I still want to climb ice and to climb hard. We all struggle with this danger to some degree when we snap on our crampons, pick up tools, and head up a climb. Hopefully, we immediately start weighing on our previous experiences, comparing ice conditions from last week or last year, assessing our fitness level, questioning how confident we are in ourselves and our partner, and maybe even pondering how many beers we had the night before. But maybe we don’t always give enough thought as to what could happen and, in the end, our self-confidence and desire win out. Guy Lacelle takes a lead fall during a competition at Festiglace in Quebec. A block of ice unexpectedly caught his rope. Guy was on steep ice and fell on to a single well-placed screw. Lucky! If that screw had failed he would have hit the deck. 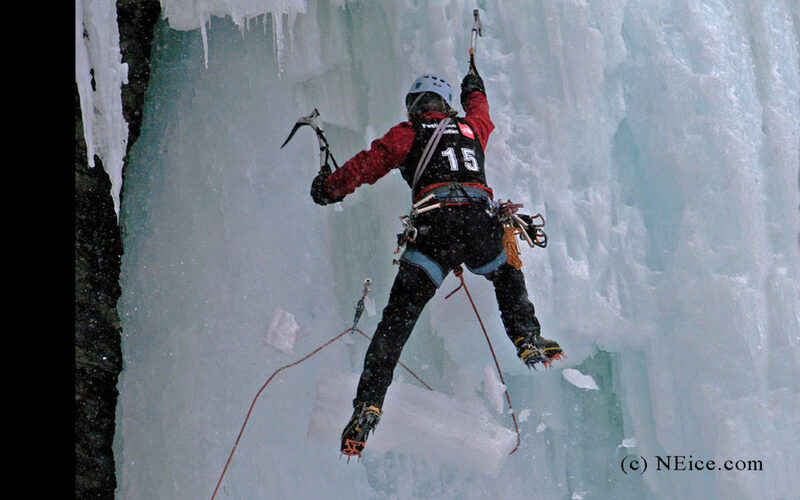 Ice climbing is different than rock climbing. Good gear is never really ever guaranteed and neither is solid ice. What was great this morning is garbage an hour later. As we climb, we tune in to feel every creak while cranking a screw into the ice and every muscle complaining about the time it’s taking us to place the gear. Our minds are on hyper-alert as the handle spins too easily, finding that big air pocket just under the surface, telling us it’s worthless as gear and your extra exertion to improve safety was just a waste of time. Maybe you clip it anyway and keep climbing. Four more screws like that and you find yourself desperately hanging onto your tools, toes going numb from the cold, lungs sucking dry wind, arms aflame, and fear starting to dig in, leaving you feeling like a mouse in a hawk’s talons. Ben Maxfield plays it safe by putting in another screw off the belay while leading on Called on Account of Rains (WI5+) at Lake Willoughby in Vermont. Don’t fall. There it is. The cardinal rule of ice climbing. Just top-roping a dozen times on the steep pillar at the local crag doesn’t prepare you for the commitment of leading ice. Dry-tooling at the gym won’t show you what a good, safe tool placement is. It takes years to learn to accurately read ice conditions, and ideally, you should be better than a cabinet-maker who knows how to work the grain in each piece of wood just by looking at it. 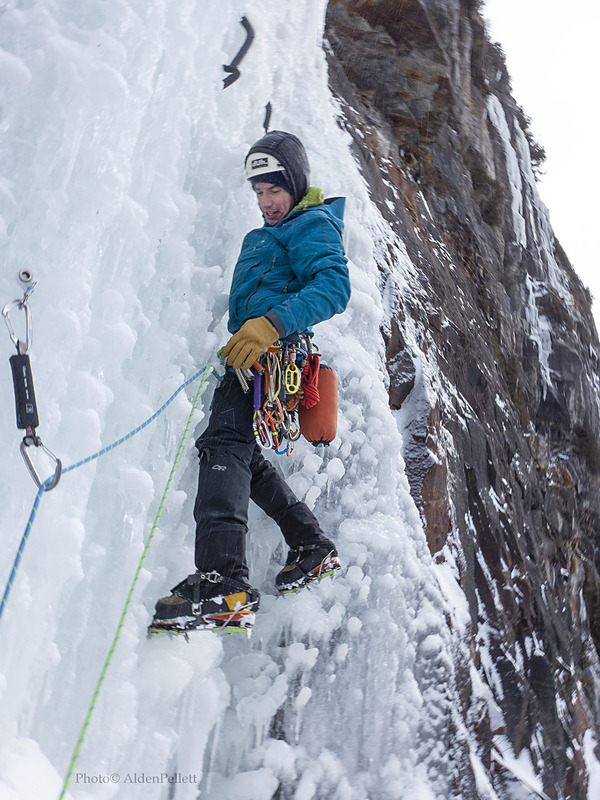 Since I first started climbing ice over twenty-five years ago, one major thing that has really stuck with me through the years was a piece of advice that came from ice climbing legend Joe Josephson: “Treat every tool placement like it was an anchor.” The idea was to never settle for less than a perfect one, because as you move up, if you don’t have complete confidence in the last one you’re hanging from, you will make progressively worse placements and eventually fall. This means testing your placements before moving up on them. Not a weak little tug—yank down on it. Make sure it’s not going to blow if you accidentally twist it a little. And you will eventually twist it. A foot might blow. 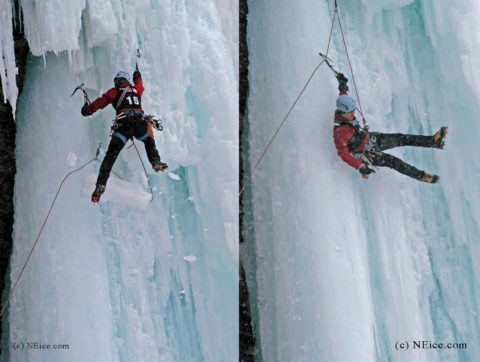 Your gear loop will catch on an icicle as you move up, throwing you off balance. The column you just stemmed out to will collapse and snag your lead rope. Warm weather and sun are among the biggest enemies of ice climbers. Too often people are wooed by soft, friendly ice as the temps soar above freezing. Just because it’s still standing doesn’t mean you should climb it. A partner and I once watched the upper part of Mindbender (WI5+) at Lake Willoughby in Vermont come crashing down like a building demolition team had dropped it. Not a sound emanated from an upper section the size of a semi-truck until it pounded itself into hundreds of shards, roaring as it scattered shrapnel down the gully, damaging trees as it went. We had been standing right there an hour earlier planning to climb it. As soon as the sun came out and we felt the penetrating heat, we headed for the shadier neighboring route, Renormalization (WI4). That decision clearly saved our lives. 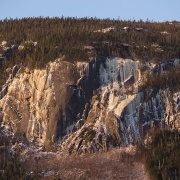 I’ve soloed Bridal Veil Falls (WI5+) in Colorado, Mindbender (WI5+) and Called on Account of Rains (WI5+) at Lake Willoughby, and dozens of other hard ice routes around the country, Quebec, and Newfoundland. But, unashamedly, I’ve also bailed off countless easier routes halfway up. I’ve hung on screws to shake out while leading. I’ve downclimbed when things didn’t look good. I’ve even just walked away from a chosen route because my partner and I just weren’t feeling the mojo that day. Yup, something just felt wrong. One recent year, I even backed off a WI3 I have done probably a hundred times, all because it had a brittle narrow section that looked like WI6 that day. It just didn’t look worth it. Two years ago, I broke the cardinal rule. Until then, I was proud of the fact I hadn’t fallen on a regular ice route in over twenty years. But I fell and I fell big. My own cloud of ambition led to a dangerous fall. 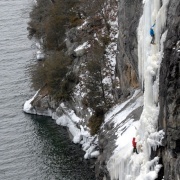 Canadian hardman Yan Mongrain leading out the top pitch of “Mindbender”(WI5+) in good conditions at Lake Willoughby in Vermont. Andrea Charest and I had arrived at Lake Willoughby in Vermont with a big goal, determined to climb three big 5+ routes in a day. We were psyched! Conditions were perfect. The day was overcast and reasonably warm. It was 30 degrees F with mostly sticky ice. We had this already, I thought! She and I would swap leads through the day. We headed straight up from the road to Mindbender. Soon racked and ready, Andrea led up the first pitch, confidently working her way through the big overhanging mushrooms with strength to spare. From her work as an experienced guide, she quickly set up a solid anchor at a stance in a protected corner of ice below the aerated upper column and brought me up. Clipped into the anchor, I leaned out and looked up. Even the easiest line above was gnarly-looking and intimidating. I’d done the route many times, so I pushed away any doubts. After all, no time to waste: we had two more routes to do after we finished this one. With a high-five from Andrea, I started up. The pitch was solidly in WI5+ territory. The beginning offered a pumpy overhanging bulge with bad feet. It led into aerated, weird fins of ice that offered some crappy tool placements and poor protection but hopefully getting into some good stemming opportunities. I was feeling the workout now, but I was shaking out regularly and reminding myself to breathe. I moved off a couple of sketchy placements after testing each one and moving as smoothly as I could; matching on a tool, I reached up to hook my way into the stemming corner. After a couple more heady moves, I discovered what from below looked decent, but now I was perched on a three-foot-wide, two-inch-thick window of ice with water gushing behind it. I had maybe four screws in below me. Maybe one was good. I could hear the water pounding down behind the sheet of clear ice. I placed a screw in some thicker aerated ice off to the side, trying to avoid tapping into the gusher. It looked good, but who really knows? I continued up carefully, gently placing a front point into a divot left by an earlier tool placement. More delicate moves, testing each one, pulling straight down on it, my elbow touching the ice. Ten more feet and I made it into thicker solid ice, but now pale and rotten-looking. I cranked a long screw into the frozen sugar. The top-out was now tantalizingly close. The screw would have to do. There wasn’t time for more. I needed to get to the established belay tree, so we could rappel and get after the next route. I thunked my way up another ten feet and found only wet rock at the top, the water running down behind the ice. There was no way to access the frozen turf above. I scratched uselessly around on the rock, but feeling a little pump coming on, I down-climbed back to the screw. It was fruitless to go that way. Looking out right, I eyed a horizontal finger of overhanging detached ice. I knew I could get up to another tree out that way. I could see frozen dirt above the ice. The feet were clearly sketchy. I’d done this stuff before, though. I needed to get to the tree; we had two more routes to do. I began hooking my tools in the space behind the top of the detached overhanging ice. Digging my front points into a smear of ice below, I drop-kneed and stretched up to reach higher, swinging hard into the frozen turf. It squished. It was just mush. Sucking in a deep breath, I stepped up higher and drop-kneed again. I swung and heard that solid thunk as the pick buried into a solid patch, partly of ice and partly old tree stump. I tugged hard. The placement felt good. Of course, it was good. I confidently unhooked my other tool from the ice finger and pulled it back to swing. Maybe one more move and I’d be at the tree. In an instant, that one tool ripped away. As a longtime ice climber, you know that falling will end badly, possibly even deadly if the gear fails. You should never fall. My mind pondered over what just happened. That tool placement was good, wasn’t it? Free from the counter pressure, my legs uncoiled, propelling me outward in an arch. Over what seemed like minutes, I slowly drifted, spinning upside down. So, this is how it ends, I thought, marveling at the blue beauty of the ice as I kept falling. The screw wouldn’t hold. I came around, almost upright now, still calmly waiting for The End. The hiss of rope through carabiners ripped into my eardrums. Air rushed into my lungs. Time sped up. My legs wrenched around violently. With the harness biting into my gut, I stopped. My feet gently brushed a huge blobby ledge of ice as I realized the last screw had held. Everything held. Andrea had been yanked off her feet, but the anchor was solid, and she was unhurt. The chaos was gone. Life was normal. Not a scratch. Fate had been oh-so-good to me. I climbed back up through all the difficulties to the last screw. Putting my ego away in a box, I put in another two screws, built an anchor and called that the top. We rappelled off a thread in the ice and walked back down to the road. She led everything the rest of the day. I relearned many important lessons that day: 1) Check your ego. It’s good to have confidence but be realistic; 2) If it looks dangerous, it probably is; 3) Be twice as strong as you think you need to be; 4) Sometimes the top isn’t the realistic top; 5) Quit while you’re ahead (see the previous lesson); 6) Just because someone else did it doesn’t mean you have to; 7) Some days it’s just better to leave early and go have a beer. They aren’t guarantees of safety, but they keep the odds in your favor. I still seek to climb hard, but I try to think more about what can happen. I hope you all do, too. Thanks for the eye opening article. You give excellent, ego-checking advice. The cost of falling while leading ice is high. I found out the hard way after Christmas is the ADK. I out-climbed my comfort. The cost was cracked ribs, vertebrae and shoulder blade. I haven’t got the bill yet, but that should be figured in too ultimately. Miss reading about Guy Lacelle’s adventure! Great write up that recalls a lot of memories from that day 7 years ago when the pillar of the Promenade came down with me on top of it. I survived that one although very smashed up. I climb with a different kind of mindfulness nowadays 2that I strive to imprint on people I climb with. Reminds me of that time (seems like a lifetime ago) when you and I were on Mindbender, Alden, and that dude next to us took a monster whip off Plug & Chug. He was unhurt, but his blood-curdling scream hadn’t even stopped echoing across the lake when you looked at me with an evil grin, and yelled “Hey, somebody tell that guys this ain’t sport climbin'”. Good times. Thanks for the great read! Alot to take away here. Agree, Andrea is amazing and the bomb to climb with. I’ve heard her say she loves climbing with you. Climb on! Great thoughts on our climbing life from a phenomenally underrated climber. One thing that’s terrifically difficult to communicate is something you touched upon, about how “It takes years to learn to accurately read ice conditions,” and how “ice climbing is different than rock climbing.” Difficult to write about in an engaging way, but so crucial to our well-being as winter climbers. Too often it gets summed up into some lame aphorism that somehow fails to convey actual severity, like ‘good judgement comes from experience…’, with a head tilt and a tip of a beer. More climbers who are looking to get into ice or up their game should read this and feel their palms sweat as they read about your fall on MB. I’ve shared to our followers. Hopefully more folks will too. My prayers are with the victim and his family. Hey Alden, I haven’t tuned into any climbing discussion in a long time but this caught my interest, thanks for writing a difficult piece. 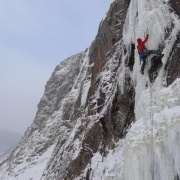 I don’t climb much anymore and never climbed ice after a few incidents of icefall while on lead made me realize it wasn’t worth the risk for me personally. I am left wondering if there’s any explanation for really high risk activities that would hold up solidly to a children’s inquiry e.g. “hey mommy why did daddy do this if he knew it was so dangerous?” I don’t ask to put people on the defensive but as an honest inquiry as someone who’s done plenty of risky run out stuff, for which I still can’t explain properly (to myself anyway). Perhaps now having a child makes me look at the whole risk calculus and responsibility differently (surely). But I must say I am surprised to see so many folks take pretty extreme risks – especially say those with people that depend on them like children, but really anyone in some ways – don’t we all have responsibilities to others that we may violate beyond a certain amount of risk exposure? Obviously the line varies for all of us, so I am sure there is no single answer – just a lot of grey area. It’s good to see climbers question where this grey area is anyway, seems healthy. Hope everyone stays safe(ish) or at least doesn’t get really hurt or dead. Our life seems to be a gift to cherish.